Play from A - B - C. C has one touch to control and one touch to strike ball towards teammate. Not trying to score, just focusing on the technique and accuracy of the shot. Have a competition to see how many times you can shoot and get it through your partners legs. P - challenge Player A to control the ball as the opposition player strikes it. P - A becomes a goalkeeper and attempts to stop ball crossing end line. 1 pt for every goal scored. Set up three gates a few yards outside the box, as shown. Have a player stand in each gate with a ball each. 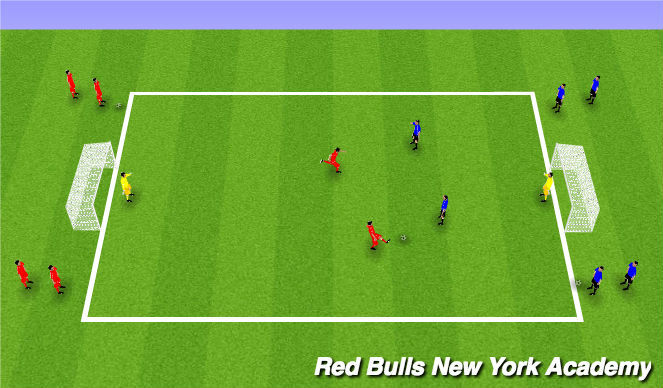 After players A shoots, Player B combines w/ player A going 2v1 against the keeper. Many different siutations gives the coach plenty of opportunity to make various coaching points. Breakaway - Close the space as quickly as possible with control, get your head up to see where the keeper is. Make the keeper commit to dribble around him and score, or while he is running out take the shot quickly when he is not set to make the save. 2v1 - Have one player commit the keeper then pass the ball to the other player for an easy open goal shot. Make sure the players are spread out enough where the keeper cannot "defend" 2 players at once. 1v1 (or 2v1) - Quickly try and beat the defender early, so you have space once you get in behind the defender to get your head up and take the shot. If you dribble to far into the box, the keeper can/will come out and take the ball. Add touch limit when possible. 2v2 game. When ball crosses the endline the defending team drop out and a new team bring a new ball on from behind that goal. Player who scored/missed must touch the goal before rejoining the game again, leaving a 2v1 for the new team on to attempt to exploit. Competition; First to 5 wins.